A sculpture commemorating the life of one of the scientists who discovered the double helix structure of DNA is being installed in his birth town. As students at Cambridge, Francis Crick, who was born in Weston Favell, Northampton and American James Watson both unlocked the key of life in 1953. The scientists, along with Maurice Wilkins, were awarded a Nobel Prize in 1962 for their work on DNA. 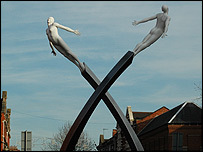 The steel sculpture called Discovery will be installed in Abington Street. 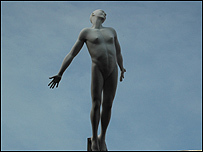 The sculpture, which stands at more than 8 metres high and includes two life-size figures, was designed by Lucy Glendinning. Lynn Wilson, chair of the Wilson Foundation, which funded the project, said: "The sculpture celebrates the life of a world class scientist who must surely be considered the greatest Northamptonian of all time." The sculpture will be formally unveiled on Thursday. Professor Crick, was born in June 1916 and died in July 2004 aged 88. Professor Watson is now chancellor and former president of Cold Spring Harbour Laboratory in the USA.